Kit Tyler has spent her entire life in beautiful Barbados, but when her grandfather dies, she decides to seek out her mother's sister in Connecticut. When she arrives in the colony of Wethersfield, however, she is surprised by the stark simplicity of everything around her. The strict Puritan lifestyle is almost incompatible with Kit's free-spirited personality, and while her aunt is welcoming, her uncle is unsure what to make of his unusual niece. The only people who seem to understand Kit are Nat Eaton, the son of the captain of the ship that brought Kit to Connecticut, and Hannah Tupper, a lonely old woman suspected of being a witch. Though Kit tries to do good things for others - looking after Hannah, teaching a young girl how to read, making the neighborhood dame school more fun - the Puritans look upon these actions as evil and before long, Kit herself is on trial for witchcraft. The only memory I have of this book from childhood is my refusal to read it. After Kirsten's best friend died of cholera on the voyage to America in Meet Kirsten, I decided I was done with stories about early America forever, and held pretty well to that conviction even into adulthood. The mention of a witch in the title and the foreboding background on the cover suggested to me that I would be scared and upset by this book, and therefore I avoided it like the plague. Had I known then how benign - and indeed, boring - this book actually is, I doubt I would have been so concerned. 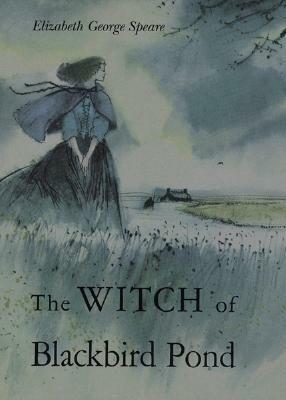 While the description given on the back cover of this book suggests that this is a story about being falsely accused of witchcraft, this is really not the main focus of three quarters of the book. Instead, the story dwells for a long time on the daily life of a Puritan family, showing what they wear, how they cook, when they pray, how they punish, and touching briefly now and then on their strange superstitions. There is also discussion of disability (Kit's cousin Mercy has a paralyzed leg), courtship, and politics, and religion. There are several characters who know early on that Kit is spending time with a supposed witch, and it is not nearly as scandalous as the book jacket suggests. In fact, the entire witch trial portion of the story goes by very quickly and is solved relatively easily, with help, of course, from a boy. Maybe it's because I've read The Crucible, but I was really expecting a whole lot more excitement from this book. It has its moments, but overall, I just didn't love it. For kids who have never heard about witch trials, this book works fine as an introduction to the idea. It's also interesting to compare colonial life in 1687 in this book, with the difficulties of 80 years before in Blood on the River. Reading the two stories in succession really highlights the progress Americans made within just the first century of the country's existence. It would be interesting to have kids read both and do a comparison. I would have no problem with my children reading this book, but I won't be rushing to share it with them like so many stories I have truly enjoyed. I'm glad to have read it, but I don't expect to think much about it in the future.